Sample the Sakkara Healing Temple CD with renowned meditation leader, Ortrun Franklin. 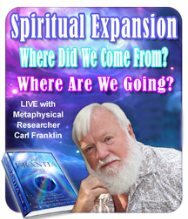 Sample Carls Alpha State Meditaion and access our Professional Products and sample the audio files from our Meditation CD's. every 3rd Thursday of the month. To Pay click here. For more information, contact us. Free Show! 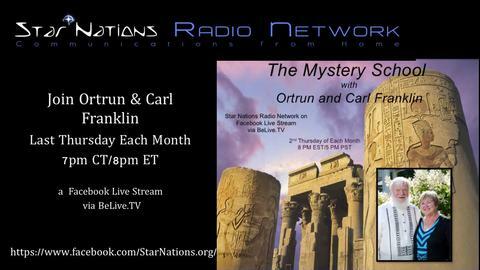 Join Carl and Ortrun for The Mystery School at Star Nations via BeLive.TV the last Thursday of the month 8pm ET, 7pm CT, 5pm PT. Click StarNations. Greetings of Divine Light and Love. We welcome you to our website. 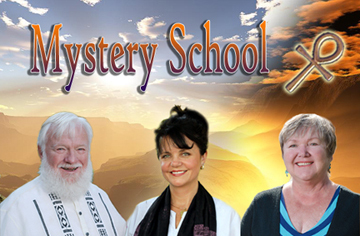 The purpose of this site is to share our 80 years of combined Wisdom of Spiritual/Metaphysical research and study. With the wisdom and knowledge we have gained, it is our goal to inform, empower and inspire you to reach your maximum potential through various venues, including: free radio shows, webinars, intuitive readings and services, classes, workshops and our audio products. Peruse our site, if there's anything that looks appealing, take it within and if guided, it would be our honor to assist you in connecting and merging with your Fully Realized Self (sahu). As you grow in Consciousness, you're raising the collective human consciousness, which is a key part of Planetary Ascension. 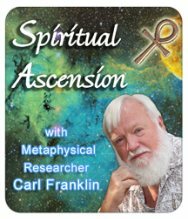 Visit Carl and Ortrun's Ascension Replays! Stay connected to the Wisdom by receiving reminders and access to our FREE events.